One year ago we looked at things to come in 2015. One of those things we’re still waiting on, but most of them came to pass and improved what it meant to get around on Capitol Hill by public transit. Capitol Hill Station opens: Okay, you knew this was coming. But a 3-minute trip to Husky Stadium or Westlake? This will be the biggest game changer Capitol Hill has seen in years. Look for service to begin in mid-March. And the next stops on the Link light rail extension plan, University District, Roosevelt, and Northgate, are only 5 years away at that. If you recall Twice Sold Tales getting the boot for Capitol Hill station, you know how fast that time can fly. Changes in the bus system: After most of the ideas to improve bus service on Capitol Hill by reducing duplication with light rail and attempting to better serve the station were pretty much all but destroyed, for good or for bad, there are a few changes coming to bus service in late March. The 43 will see its service reduced by quite a bit, to peak only, peak direction, and the new route 10 will take over for it between Bellevue Ave and 15th Ave. That being said, almost every single bus on Capitol Hill right now is running more frequently thanks to Seattle voters who passed Prop 1 in November 2014. Service is pretty dang frequent on the 49, 48, and 10 even if all of those routes don’t quite connect in the way that would benefit the neighborhood in the long term. Pronto bike share begins a new phase of expansion: After being taken over by the city’s transportation department, the 2016 city budget includes $5 million to expand the system. Some of this expansion will likely take place in 2016 but expect more to follow. Currently the system covers most of Capitol Hill, but there are some notable gaps. An area ripe for seeing expansion: the Central District and North Capitol Hill. With so many bus routes not quite getting to Capitol Hill station, Pronto can be great last-mile booster and we’ll be covering how well it is integrated as a full-fledged transit mode. The Move Seattle levy voters passed last November will also pay for several new bike lanes and neighborhood greenway corridors that will make getting around by bike more of an option for a wider range of people. Oh yeah… the First Hill Streetcar: With a slew of improvements being put in right now to improve its sister streetcar, the South Lake Union Line, and a possible center city connector on the way that could merge them into one line, soon enough the delays in construction will be forgotten and the dim sum express will be ready to pick you up. As Capitol Hill grows and the options for public transit also expand, we’ll continue to report on what’s being done to make our neighborhood accessible for all who live here and those who visit. Cheers to a good 2016, Capitol Hill transit riders. King County Metro asked and the people responded: Change is coming to the 10. After receiving overwhelmingly positive feedback in a recent public survey, Metro’s decision to reroute the popular Capitol Hill bus comes as part of its preparations for the start of light rail service to Capitol Hill Station next year. Under the change, slated to go in effect in March, the 10 will scrap its E Pine and 15th Ave to E John sections to travel up the Hill on E Olive Way to serve the Broadway station. With the 43 set to drastically reduce its service, the E Olive Way/E John Street corridor would have only had the notoriously unreliable 8 connecting it with the light rail station. Metro retreated from its proposal to reroute the 11 up E Olive Way and E Thomas to get to Madison Park, citing problems with turning at 19th Ave and E Madison. Despite concerns, we think this change would better meet ridership demand along East John Street and in the Summit neighborhood, where there are nearly 1,000 bus boardings every day (940 people getting on and 1,300 getting off buses) on current Route 43. The Summit neighborhood and Olive corridor are the densest parts of Capitol Hill. Residents in this part of Capitol Hill face a steep climb to the light rail station. While the Route 43 will continue to operate in the peak periods, making this change avoids a significant net reduction of service at other times of day. 45% of 1,269 respondents approved of the changes (PDF) in the survey Metro put out earlier this month. The revamped 10 would also provide easy connections from the light rail station to Group Health, the 15th Avenue retail core, and Volunteer Park. To address concerns over bus capacity on the 11, Metro says it will use 60-foot-long articulated coaches during peak hours. Metro: Potential Change to Route 10 Metro is considering moving Route 10 to operate on E John Street and E Olive Way between 15th Avenue and downtown Seattle (along the same pathway as Route 43 between 15th Avenue and downtown Seattle). This change would better meet ridership demand along E John Street and in the Summit neighborhood, where there are nearly 1,000 bus boardings every day (940 people getting on buses and 1300 getting off) on current Route 43. This change would remove bus service along 15th Avenue E between E Madison Street and E John Street. 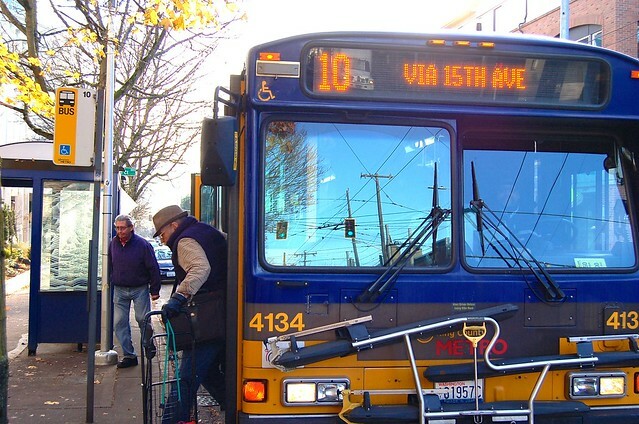 A majority of the average daily ridership along this part of Route 10 (460 “ons” and 710 “offs”) are at the stops closest to 15th Avenue E and E John Street and 15th Avenue E and E Pine Street or E Madison Street. These stops would still be served by routes 8, 10, 11, and 12. If this change is made, it would occur in March of 2016. In a response to complaints — and a few ideas — generated by the final erosions of its planned Capitol Hill routes restructure in preparation for the start of light rail service to Capitol Hill Station, an unusually nimble King County Metro is turning on a dime to ask the community about one final proposal. Metro has released a survey which spring boards off an idea floated on the Seattle Transit Blog to reroute the 10. The 10 currently takes E Pine up to 15th Ave: routing it via Olive Way and E John would not impact its reliability much and would allow thousands more along E Olive and 15th Ave to have access to the light rail station. As we reported last week, Metro retreated from its proposal to reroute the 11 up Olive Way and E Thomas to get to Madison Park, apparently because of an inability to make a certain turn at 19th Ave and E Madison. This change would have connected Madison Valley and Madison Park to the Capitol Hill light rail station and also provided an east-west connection to residents off Olive Way who are losing their 43 service at most times of day. But moving bus service off any segment of Madison Street was apparently a nonstarter for certain contingents in Madison Valley. So with the announcement that the turn could not be made at 19th Ave, the 11 is back where it runs now, with nothing to replace 43 service and the only route running on Olive Way the unreliable route 8. Connections to our brand new light rail station at Broadway and John would be worse than they are today. That’s what we thought was happening — at least, until Monday. Moving the 10 is not a perfect solution: riders along 15th Ave between Pine and John would lose all bus service. But it is an idea Metro should seriously consider after deciding to reverse its plans at the last minute. King County Council member Dave Upthegrove said he was shocked to learn that youth can be charged with misdemeanors for evading bus fares. The charge could also lead to longterm bans from riding the bus. This week, the Council adopted a motion to reduce the penalty to a civil infraction. “Young bus riders should be held accountable for evading a fare but not charged criminally, and I am pleased that the Council supported me in changing this policy,” Upthegrove said. The motion also calls on the county to allow cited transit riders to resolve their infractions at courthouses closer to where they live. Currently, all transit infraction hearings are held at the Shoreline Courthouse in a policy known as the “Shoreline rule.” It’s particularly a problem for younger riders, who are most frequently cited in South King County. Issuing a longterm bus suspension for a juvenile must may also be limited to court orders under Upthegrove’s bill. The motion calls for the county to work towards implementing the policies by March. Unfortunately, adult offenders will still have to settle such matters in Shoreline. The motion also calls on the county to ensure all transit security officers receive specific training to work with adolescents. Hill-friendly and relatively clean and quiet, electric trolleys are important workhorses in Seattle’s commute. Starting this week, Metro’s ancient fleet will begin a two-year rollout of replacement trolleys.